Now this is more like it! 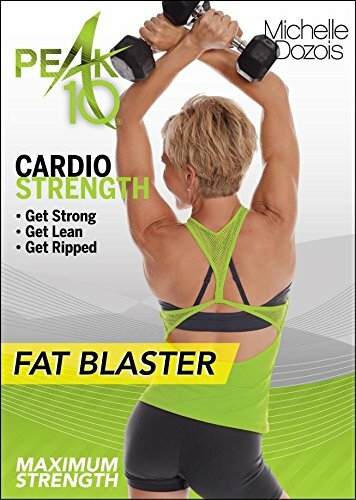 Peak 10 Fat Blaster Cardio Strength is another tough and intense metabolic weight training workout from Michelle Dozois. The Fat Blasters are the latest installment in her Peak 10 series and I did not like Fat Blaster Cardio Interval Burn at all. The Peaks were not very intense and the choreography was very complex. But that was not an issue with Fat Blaster Cardio Strength. Very doable and mostly athletic cardio, excellent metabolic strength training and intense Peaks. It really got my heart pumping. Probably not the most intense Cardio Strength workout in the Peak 10 series but excellent nonetheless. I’m especially pleased because I was so disappointed in Fat Blaster Cardio Interval Burn. Michelle’s Peak 10 workouts are based on a structure she calls “metabolic blueprint” which consists of a base, an ascent, a climb and a peak. This workout is a cardio + strength workout that consists of 5 of these metabolic circuits, each repeated for a total of 10 circuits. Base and ascent are the strength portion of the circuit. The climb is cardio and the peak is plyometric/anaerobic HIITs of approx. 15 seconds. There is no warm up. You could say the first two circuits are the warm up since there is no peak component in those circuits. However, it doesn’t feel like a warm up! The remaining 8 circuits all have peaks. Michelle added a few new features to her latest Peak 10 workouts that I really like. First, you can play the whole workout which is 56 minutes long or you do a shorter premix; she has two premixes that are 35:30 minutes long (more on those in a moment). The workout has a modifier showing some lower impact moves (mostly for the Peaks, but during some other parts, too) and a Movement Review section which is 3:30 minutes long and introduces you to some of the more complex moves so that you can either practice them or at least be ready for them when she throws them at you during the workout. Michelle’s Movement Reviews are always good to watch if you are not doing the workout frequently because even if they are not overly complex moves, there is no teaching going on during these workouts. They are fast paced and everything is thrown at you quickly–so being prepared for some of the multi-step compound moves prepares you for when it happens. Just like all of the other Cardio Strength workouts you will need a minimum of 2 sets of dumbbells–one light and one heavy. I used 3 sets for this workout. 8 pound dumbbells for my lights and for the heavy segments I used 10 pound dumbbells for the first heavy circuit and 12 pound dumbbells for the second heavy circuit. In the past, when I did Peak 10 workouts more frequently, I found that the more often I did them, the heavier I could lift. I do think that in the future I will increase the 12 pound weight up to 15 and the first light circuit that I used 8 pounds for I could up to 10 pounds, but the rest of them the weights I used (10 and 8 pounds) were pretty challenging and would probably keep me challenged for a while. I’m a big fan of Michelle’s Peak 10 Cardio Strength workouts. They are some of the very best metabolic workouts out there and I really, really need to start using them more. I am not such a big fan of her Peak 10 Cardio Interval workouts because the majority of them have the complex choreography issue going on. It has been a while since I’ve done them but I don’t really remember any of them until Fat Blaster being so complex I have no interest in returning to them. However, the Cardio Strength workouts never have super complex choreography. Some are a little more complex than others but it is always doable. And btw–I never used her Peak 10 Cardio Strength workouts as strength workouts. They are pure metabolic strength training and therefore I only use them on cardio days. Because the strength work is fast paced and always compound, the time spent on individual muscle groups is never enough to qualify for actual strength training. Fat Blaster Cardio Strength is 56 minutes long; there is no warm up and the cool down/stretch is 5 minutes long. There are 5 circuits and each circuit is repeated twice for a total of 10 circuits. The first circuit has no Peak and uses light dumbbells so you can view it as a very intense warm up! You use dumbbells for the Basecamp and the Ascent and no dumbbells for the Climb and Peak. I’m not going to break this workout down in detail but I will give an overview. Circuit 1 uses light dumbbells; again, I used 8 pounds, but I could probably really challenge myself with 10 pounds in the future. Circuit 2 uses heavy weights; I used 10 pounds and due to some of the exercises (not all, but there are a lot of different exercises during the ascents, and some are more challenging than others) I don’t think I would be able to execute some of the exercises with good form if I used heavier dumbbells. The Peak for Circuit 2 is lateral jumps, touching the ground at the bottom. Circuit 3 uses light weights and 8 pounds challenged me sufficiently for this one. The Peak is reverse tuck jump which is basically rock star jumps but trying to touch your hands to your feet while in the air. Circuit 4 uses heavy weights. I used 12 pounds for this but I think I could use 15 pounds in the future to really challenge myself and still maintain good form. The Peak is jumping kicks. Circuit 5 uses light weights and again, 8 pounds was sufficiently challenging for me. The Peak is tuck jumps with arms overhead. Premixes: The premixes are each 35:30 minutes long. They both use Circuit 1 and the cool down/stretch. However, Premix 1 uses Circuit 2 and Circuit 3. Premix 2 uses Circuit 4 and Circuit 5.